Location: At the end of an un-named minor road. There is still a road sign pointing to the station at the start of the road. 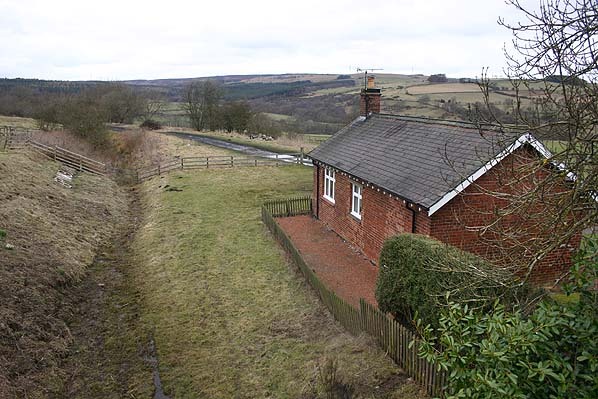 Present state: The stationmaster's house survives at the south end of the former platform; it is now used as self catering holiday accommodation. The platform has gone apart from a section in front of the station building. On the bank opposite the station building the name 'Brinkburn' is laid out in stones, it is unclear if this is an original feature or more recent. The goods loading bay survives alongside a public footpath to the north of the station. Close to this there is a concrete structure which is part of the base station for the aerial ropeway running from the station to Healey Coate Colliery. There is also a WW2 pillbox close by, presumably built to defend the station area. Notes: Brinkburn station was sited on the up side of the line. The station building was of timber construction clad in vertical weather boarding with a corrugated iron goods lock up on the platform. 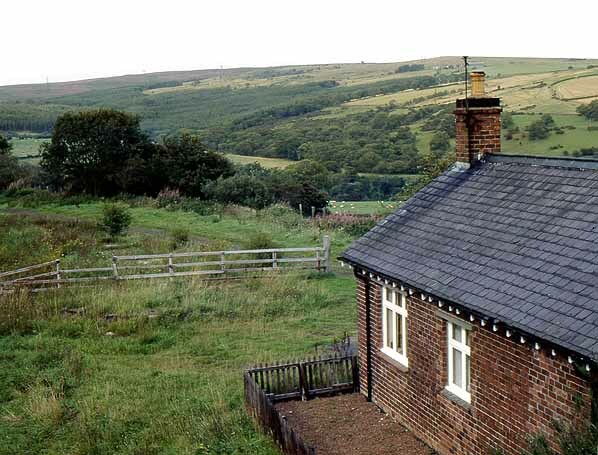 The station also had a wooden hut that originally acted as a signal cabin and a single story stationmaster’s house. There was a single goods siding on the up side serving a loading bay, this faced towards Rothbury and could only be used by down trains. 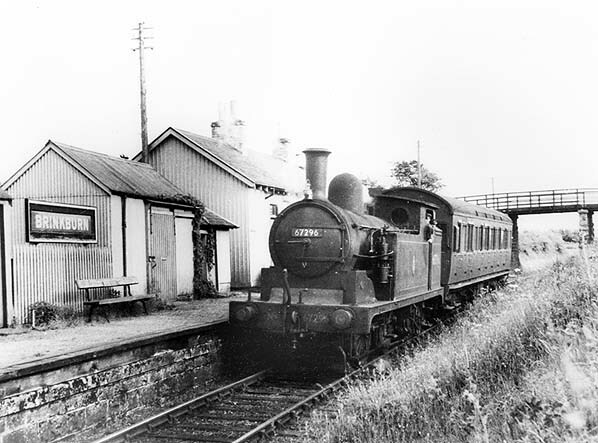 The station served Healey Coate Colliery and was linked to it by a two mile aerial ropeway. By closure Brinkburn had been downgraded to a 'halt'. At closure it was designated a 'public delivery siding'. the lever cabin to its right. 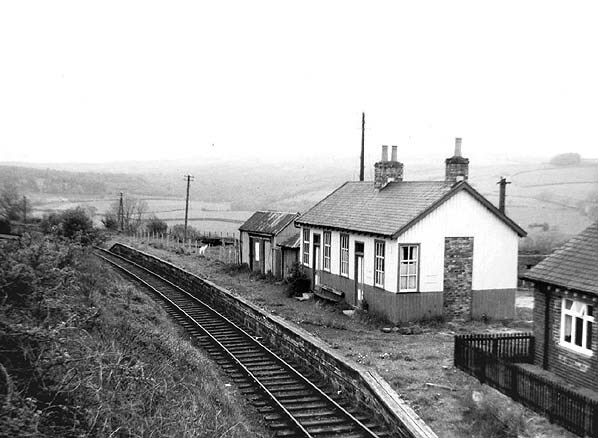 Brinkburn Station looking north in April 1963. 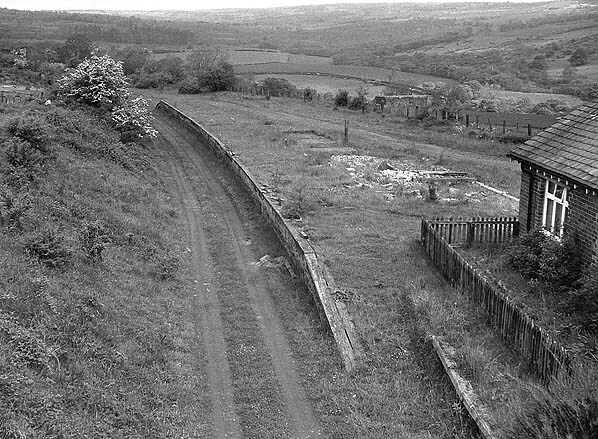 Brinkburn Station looking north in 1971, the platform buildings appear to be recently demolished. Brinkburn Station looking north in March 2006. The stationmaster's house survives, this was sited at the south end of the platform and was immediately adjacent to the weather boarded station building.